Lebogang, who has also been a finalist and the only one with a disability in the Face of the Globe 2017 competition, will be competing against 23 other contestants from across the world. Lebogang was born and raised in Vryburg in the North West province. She graduated from the NWU’s campus in Mahikeng with a Bachelor of Social Sciences in psychology in 2014. Lebogang has had a very interesting and successful life regardless of what some may consider a limitation. She is well-known for representing South Africa in the field of Wheelchair Basketball, and has also been part of the South African Wheelchair Basketball league. This enabled Lebogang to represent South Africa at the Paralympic qualifiers as well as a few other international sporting events. Lebogang’s most noteworthy accomplishment was to challenge the status quo by becoming Africa’s first ever runway model in a wheelchair. This achievement was a big part of her drive to work towards disability inclusion. She hopes that every aspect of life will one day be accessible to people with disabilities. Lebogang felt insecure about her legs for most of her life. She was three when she was diagnosed with Post-Polio Syndrome, which led to her becoming wheelchair bound. She also had multiple operations that left her legs scarred. “I eventually had to challenge myself by loving the things I cannot change,” says Lebogang. “I have learned that embracing my flaws isn’t failure; instead it means that I have reached acceptance. The Miss Wheelchair World Project was started with the aim of changing the world image of disabled women, breaking barriers and showing that being in a wheelchair is not a limitation. 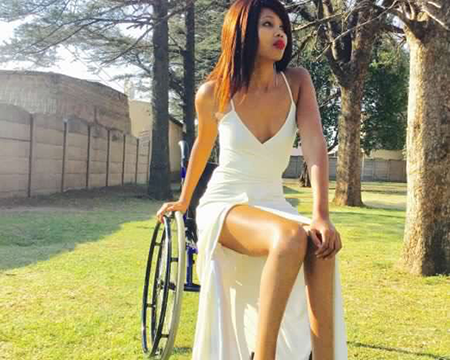 NWU alumna Lebogang Monyatsi will represent South Africa at the Miss Wheelchair World pageant.